Insta360 Air VR camera was launched for 360-degree capture in high definition. It can capture the videos, images and can also live stream the content instantly across social media platforms. It is the most affordable professional camera which can be very useful for the social media savvy. The live streaming has become the most important for marketers to brands to reach the people, and it has developed several stages and at last, reached VR 4k 360 streaming. 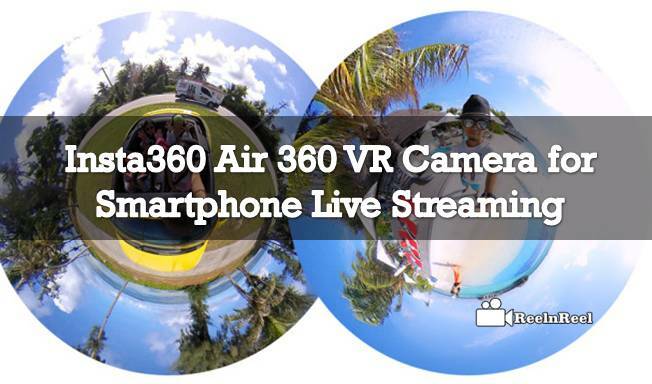 The 360 live streaming is the big hot news across the web. The camera is designed especially for the Android, and there are some millions of Android users comparing to other platform users. The Camera consists of live stream gigs in which the 360 degrees live streaming platform allows you to share the live stream across YouTube, Facebook, twitter platforms. The images can also share across WhatsApp and messenger platforms also. The high definition images can be featured on the 210-degree view with its fisheye lens by supporting the real-time stitching of images. The new Insta360 air camera captures the images with 3k stills and 2k videos. the camera also boasts with a professional resolution. The camera is inbuilt with the advanced technology with good stabilisation supported algorithm. It makes easy for people to capture the panoramic shots with ease. Once it was getting connected to the Android devices, the app will connect automatically and ensure better panoramic shot you never miss. It also features the best editing tools where users can prepare their own masterpiece. The Insta360 camera can also have a virtual reality mode where users can create a beautiful, immersive effect in their VR headsets. The camera was light in weight and is portably comparing to the other conventional 360 degree cameras. The Insta360 air designed with a Smartphone extension and the device can be used as a webcam that helps in connecting the laptops using a multi-functional cable which can capture the 360-degree live stream. The Android app is included with an image and video editing tools which help the users to edit their images and videos basing on their taste. There are four viewing modes with an excellent photo and video capturing functionalities. Users can also access the previous photos in an android app Gallery. The app is straightforward to use. The camera consists of Flat mode, Sphere mode, VR mode and Planet mode/ The flat mode looks like a linear image shot and whereas the sphere mode covers you as if you in middle of the image. The VR mode is different, and the planet mode gives you complete 360-degree experience with 4K effect. Therefore, this new Insta360 Air camera is one of the best cameras for live streaming especially for the android users across the globe. The camera with App provides a different experience to the users. Hope we can expect more interesting features incoming developments.